Earlier that night: "Is that really what you are wearing?" "Yes, men love huge feather hats. They find them very attractive." "Alright...whatever, let's just go." 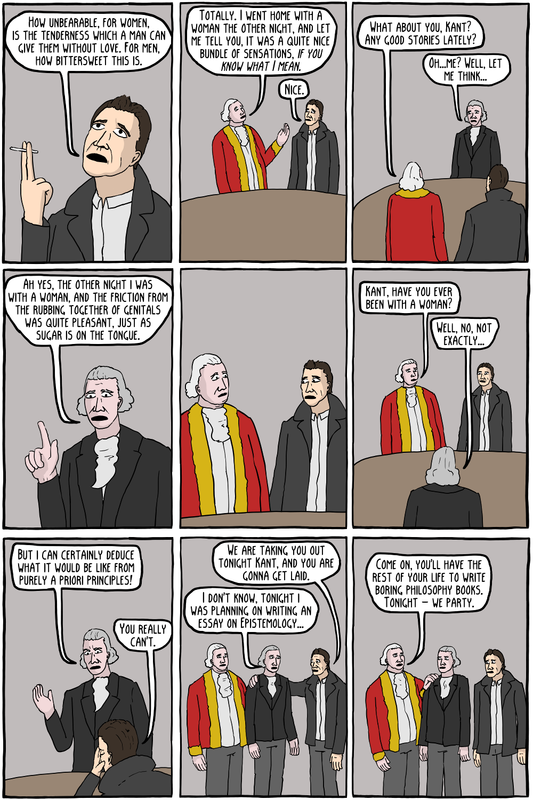 Immanuel Kant was a very boring man. 1. While he never married, he had an active social life, including a friendship with Joseph Green, an English merchant. 2. It is a myth that he never traveled more than 16 kilometers from his hometown. He once traveled as far as 20 kilometers to tutor philosophy, and another time as far as 145 kilometers, again to tutor philosophy. 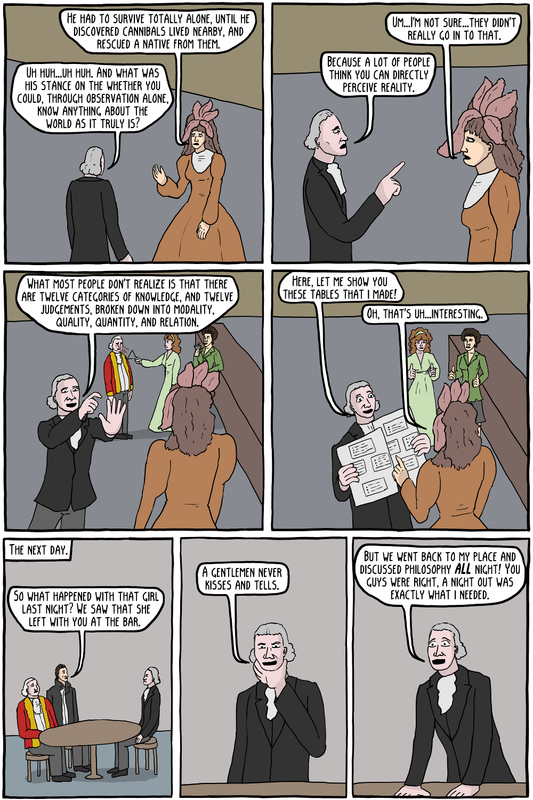 Now, and maybe this is just me, but if I arrive at the end of my life and a biographer is charged with defending me against accusations of being boring, I should hope that they can come up with something better than "once traveled a small distance to teach philosophy, and had one friend." 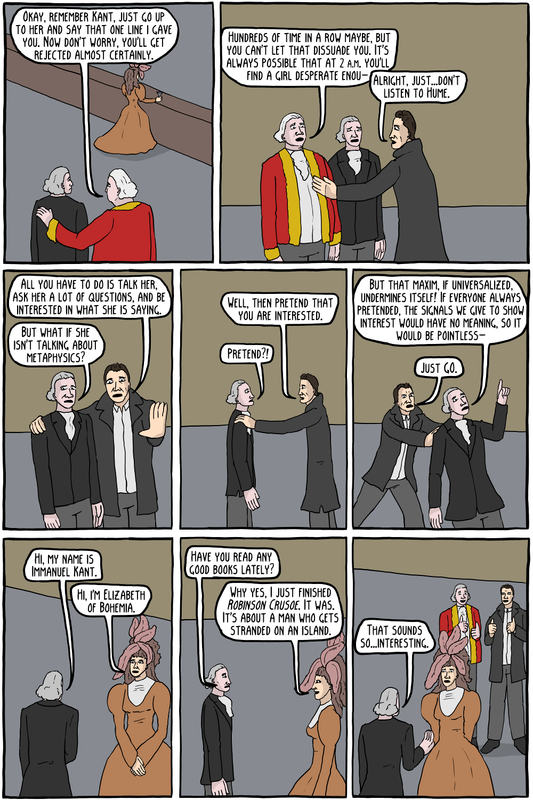 David Hume and Albert Camus, on the other hand, liked to party. The woman at the bar is Elizabeth of Bohemia, who also never married. She is best known for her correspondences with Descartes, where she criticized his substance dualism. If you are interested in the philosophy of Immanuel Kant, Robert Wolff has a great lecture series on YouTube that he is putting out for free. He's also super old, and tells a lot of great old man stories, if that's your thing.